The story goes like this: Rob Jackson and Steve Siadek, both corporate executives in their respective fields met at a local no kill shelter, and became friends. They had a common passion in helping pet owners afford veterinary care, and to help pets in need. They put their entrepreneurial minds togethor and in 2008, Rob and Steve co-founded Healthy Paws. Today, Healthy Paws is partnered with Aon Corporation, the world’s largest insurance broker, and plans are underwritten by the Chubb Group, an A plus rated insurer, with over 25 billion surplus. In additon, Healthy Paws is now one of the top companies for customer service and affordable monthly rates. In fact, Healthy Paw boasts the highest customer satisfaction ratings among its competitors. The founders of Healthy paws developed the Every Quote Give Hope grant program that donates funding to animals in need. All you have to do is get a free quote from their website. Healthy Paws is the first pet insurance company do away with paper forms, and offer an app to submit and track claims. 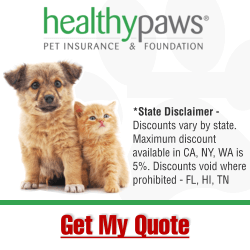 The company full name is, Healthy Paws Pet Insurance and Foundation. 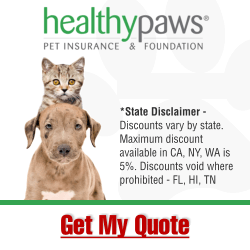 So when buy a policy from Healthy Paws, you are also donating to their foundation, which awards grants to non-profit rescue organizations and shelters. Filing Claims Options Take a photo of the vet bill and submit via mobile app or online customer center. You can also email or fax the vet bill. No need for claim forms. Enrollment Requirements Pets younger than 6 years are required to have had a veterinary exam within the last 12 months, or within the first 15 days of enrollment. Pets older than 6 years are required to have had a veterinary exam within the last 30 days, or within the first 15 days of enrollment. No bilateral condition coverage for other injured knee if first knee was pre-existing prior to enrollment. Although Healthy Paws has some exclusions as noted above, they do boast the highest ratings for customer satisfaction and reviews. In addition, Healthy Paws fits the formula of what the pet parent is looking for today, which is a simple plan with no payout caps, a mobile app allowing paperless claims, and affordable monthly premiums. Furthermore, 95% of claims are settled and paid out within 3-5 days. It is important to note while Healthy Paws provides coverage for hips dysplasia, this coverage does not include newly enrolled pets aged 6 and above. Therefore, the best time to enroll with Healthy Paws is when your pet is aged 6 and under. So if you are looking for a pet insurance company with an unlimited payout plan, affordable monthly premiums, and a pet insurance company with consistent high customer satisfaction reviews, click on Get My Quote from banner link above, and check if Healthy Paws plans and prices would be a great fit for you and your pet.